I've always loved magical realism, ordinary worlds elevated by enchantments. My bookshelves are lined with Gabriel Garcia Marquez's books, I've been stunned by the capacity of Jorge Luis Borges, and more recently, I enjoyed The Night Circus (which will draw many comparisons with the Toy Makers). So it's not a huge surprise that Robert Dinsdale's The Toy Makers was right up my street. The book is set in a toy shop in London, and spans the period from before and after the two world wars. It follows Cathy, pregnant while still a girl, and the life she made with the Godman's, the father and his two sons who run the shop. The toys they make are magical, forged by recreating memories of childhoods lost, and every winter on the first frost of the year, they open their shop doors until the first snowdrop appears. My only complaint about the book, and a minor one, is that the characters didn't really form. The book covers 50 odd years, but by the end of it, you still don't really know them, or more importantly, root for them. However, the writing was excellent, crisp and clean, the pace solid, and the ending was gorgeous. A very solid 5/5, a must-read for lovers of the Night Circus. Book kindly supplied by Netgalley for an honest review. 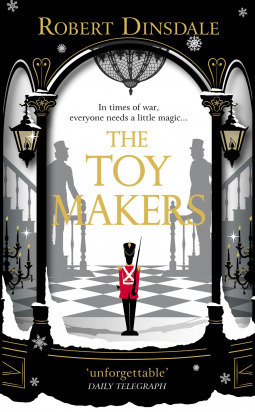 Sign into Goodreads to see if any of your friends have read The Toymakers.